Aging in Place Technology Watch offers a cost-effective annual research retainer as a service to technology vendors and service providers, as well as businesses and non-profits that can include: preliminary review of and input to market analysis research, a custom document or presentation about best practices, introductions to possible collaborators, market analysis and trends in the vendor's specific market category; and phone consultation. Some non-profit organizations need to survey constituents about how they view technologies, services they currently have or may need in the future. Startups may want to post a survey to understand possible interest in a new product, service, or feature. Current companies in the aging-related market segments benefit from fielding surveys that maximize public visibility and demonstrated reach in that segment. And any organization seeking additional funding may use a customer satisfaction survey to underpin the justification and business case. Very large data sets often contain data that, when examined, offers insights about population trends and markets. The US census household data, as one example, offers a treasure trove of information about family living circumstances, including grand-parenting and multi-generational housing. The US government hosts large publicly available subsets of surveyed information that can be combined with other data sources. 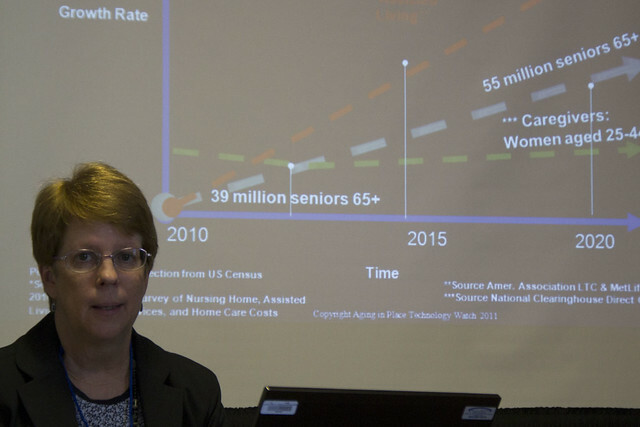 For example, by knowing the population distribution by age in a specific market, it is possible to combine that information with an analysis of the geography’s distribution of assisted living communities, senior centers, and home care agencies. The results can be presented in spreadsheets, graphics or reports, as well as analyzed with recommendations about opportunities – and highlights of resource gaps. A map is worth a thousand words. One of the more compelling ways to present information about resources, population concentrations and distances between resources should be to place the results on a map. Using publicly available mapping tools, a Geographic Information System can combine in-the-field collected data with other data sets, enable users to drill down by locality or resource type, and use that to better understand a community, market or to deliver a valued service. Aging in Place Technology Watch can work with technology companies in a workshop format to define and polish a technology provider's positioning and value statement. This may be particularly useful to for startups about to enter the market for the first time or enter an existing market with a new product. This workshop is intended to boost management awareness about available technologies to improve the lives of residents in Assisted Living Facilities, Continuing Care and Independent Living communities. Laurie M. Orlov, recognized industry analyst and top-rated effective speaker, can be engaged to keynote, deliver webinars, participate in conference panels or speak to a wide range of audiences on specific or general topics related to aging in place -- as well as trends on aging and business opportunities to serve the growing aging market. For complete pricing on services, send e-mail to laurie@ageinplacetech.com.